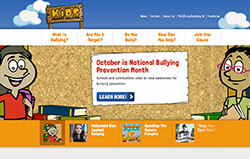 PACER's Teens Against Bullying Web site is a relevant, edgy, and unique educational resource for bullying prevention designed to engage, empower and educate all teens. Information is presented in an innovative, engaging and interactive style. There are solutions—creative resources that all teens—can use to educate other teens and young people and to raise awareness in their community or to help other teens in bullying situations. PACER offers dozens of videos featuring Disney actors, NFL players, musicians, students from across the country, and others to help raise awareness for bullying prevention.